I reviewed the very first BlackBerry Bold 9000 way back in October 2008, so I was looking forward to seeing the latest addition to the Bold family. In terms of design, this phone has come a long way. Finally, the Bold gets some touchscreen love, but still retains that iconic QWERTY slab design. 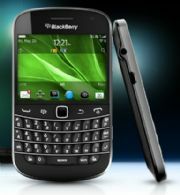 The pricey Bold 9900 ($250 with two-year contract from AT&T) is the thinnest of the series at only 0.41 inches thick. The Bold 9900 feels quite nice in hand with solid brushed metal edges, a glass face and a glossy patterned back. The Bold series has always been the most fashionable of the BlackBerries (well, the first Bold’s leather back kind of weirded me out) and the 9900 is definitely no exception. The whole phone feels high quality yet durable—which is gratifying, given its price! The Bold 9900’s keyboard is one of the best I’ve used with its sculpted keys and guitar fret-like dividers in between keyboard rows. The keyboard is wide enough so that even my larger handed colleagues felt comfortable using it. The 2.8-inch 640-by-480-pixel display is bright, sharp, and responsive though I can’t help but feel a little strange when I use a touch display that small. Like the Torch 9810 and the full touch Torch 9860, the Bold 9900 runs the new BlackBerry OS 7. You can read our full hands-on of OS 7 here. BlackBerry OS 7 is a lot faster than OS 6, but aesthetically it is very similar. One cool feature, however, is that the Bold is the first BlackBerry to offer Near Field Communication support (NFC). When I spoke with RIM last week, they informed me that the Bold is the first of many devices that will have NFC support and that the company is working with developers in creating NFC enabled apps for mobile payments and content exchange. We’re going to have a full rated review of the Bold later today so stay tuned for updates on its performance, camera, and other features.